This post has 6,137 views. Here is another short trip/visit that’s part of my efforts to get to know British Columbia better before I leave for the US for grad school. This time, I visited Grouse Mountain, one of the more notable attractions in the Lower Mainland area. 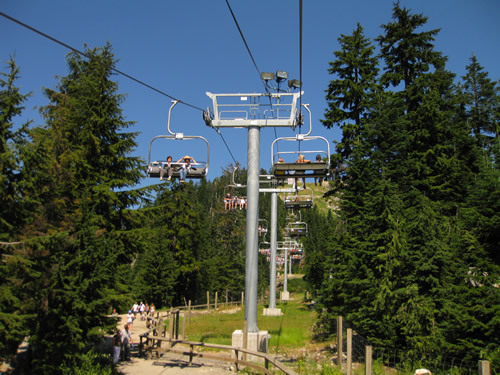 Located in North Vancouver, Grouse Mountain is a ski resort in the winter and a scenic park with shows and a trail in the summer. Despite living in the Lower Mainland for quite a few years, I’ve never been to Grouse Mountain before, and so last weekend my family decided to go there. The post is short description of our trip accompanied by some photos. The Skyride cable car that carries people up and down Grouse Mountain. The mountain top area where most of the fun stuff is located. Getting to Grouse Mountain is pretty simple by car or bus. You just have to get to Capilano Rd. in North Vancovuer and keep driving North, continuing onto Nancy Greene Way and you’ll see the signs. General admission to the mountain top is around $40 per adult which is not cheap, but the resort offers annual memberships for $100 for the frequent visitors. 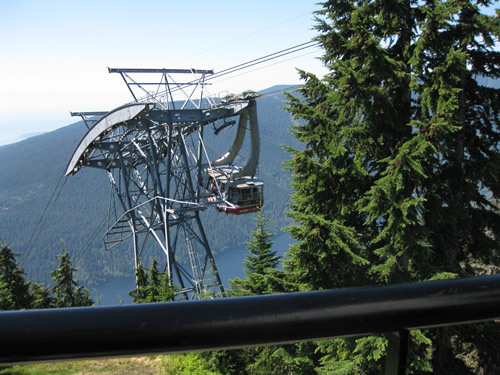 There are two well-known ways to get up the mountain: either take the Skyride cable car or climb up through the Grouse Grind, a popular trail well-known for its steepness. I originally wanted to try the Grouse Grind, but we went on a hot summer day and my family thought it wasn’t the best idea, so we took the Skyride up instead. 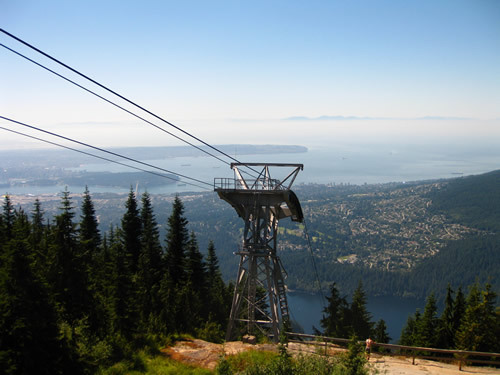 The Skyride takes about 6 minutes to reach the mountain-top area, and as the car gets higher visitors can get an increasingly wider view of the cities of the Greater Vancouver area. The view from on top of Grouse Mountain. The most prominent city in this photo is West Vancouver. Upon arriving at the mountain-top area, we were treated to an awesome view of the cities below. we could clearly make out West Vancouver, North Vancouver, Vancouver, Burnaby, and even parts of Richmond. After spending some time to take in the scenery and eat lunch, we started exploring the area. 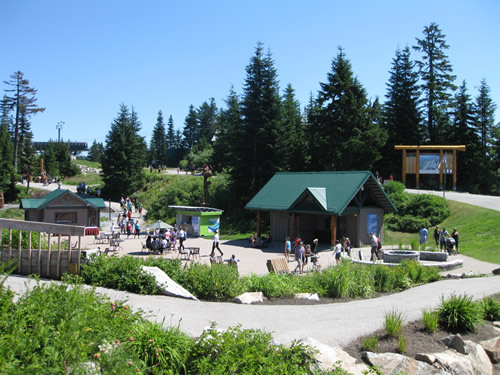 There is quite a bit of things to do and see on Grouse Mountain in the summer. For one things, there are a lot of impressive looking wood carvings placed everywhere. There are also a couple of live shows, and visitors can also go zip-lining or paragliding (at extra cost). The zip-lining and paragliding looked like they were fun, but we stuck to the more tamed activities on the mountain. 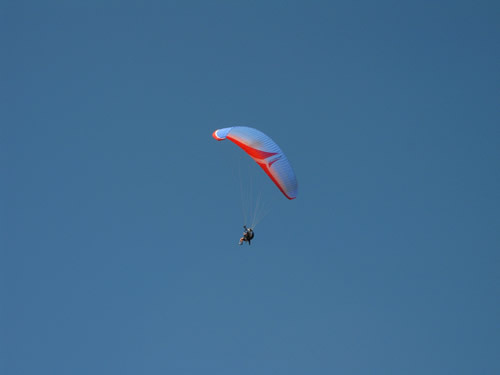 A photo of a paraglider (a customer and a pilot/guide) up in the sky. It looks like a lot of fun. 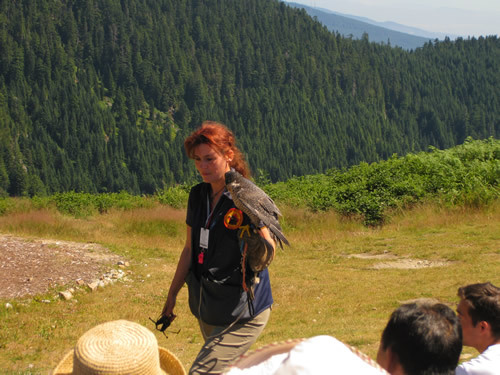 A handler brings out a peregrine falcon during the Birds in Motion demonstration. First we watched the Birds in Motion demonstration, during which a red-tailed hawk and a peregrine falcon performed. There was a bald eagle too, but he didn’t fly during the show we watched. Next up, we took the scenic chairlift to the highest point of the mountain. The scenic chairlift is quite slow compared to your average ski chairlift, but fortunately there was a slight breeze which makes sitting on the chairlift under the hot sun a bit more bearable. With the scenic chairlift and Skyride, it’s more fun to ride them downwards than up. When riding up, your sight tend to be focused on the the mountain side that the lift is climbing up, but on their way down you can see the gorgeous view of the cities below the mountain. The scenic chairlift up to the peak. It's very very slow. The Eye of the Wind turbine. Supposedly it can supply up to 50% of the power needed by the park. The peak of the mountain is where people start their paragliding or zip-lining adventures. 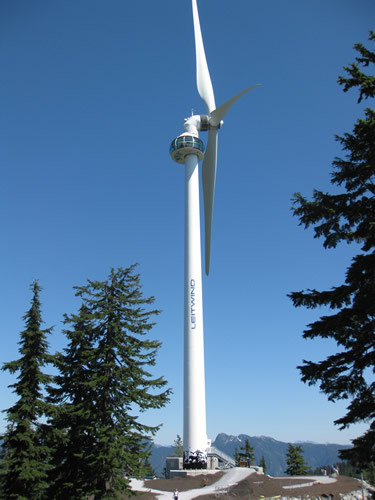 The other attraction to see on the peak is the Eye of the Wind, a giant wind turbine with a viewing pod for visitors. The Eye of the Wind is about 50m tall and can be seen from Vancouver on a clear day. Going up into the viewing pod costs $25 which we thought was a bit expensive, so we just looked around the bottom of the windmill instead and then took the chairlift back down. That’s it for my first trip to Grouse Mountain. This time I just looked around a bit and didn’t take part in too many of the mountain-top activities, but maybe next time I’ll come back to tackle the Grouse Grind or perhaps even ski in the winter. First I’d have to learn how to ski though lol.